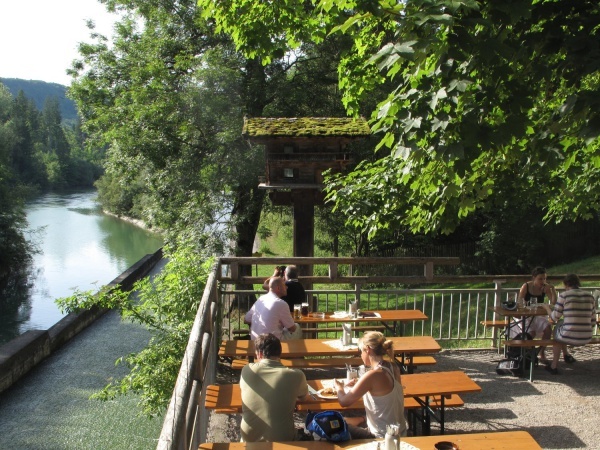 The Gasthaus zur Mühle beer garden is located at the Isar in the Mühltal (mill valley), 21 kilometres south of the centre of Munich. In year 1007 the site was mentioned the first time in a document. Until the 18th century a mill known as Huismüle operated on this location. The current building exists since 1815. The beer garden is divided into two sections, the self-serviced area and the serviced area. The serviced area is located next to the restaurant building. Typical beer garden benches stand partly under large trees. The beer benches of the self-serviced area stand on a grass ground across a small road. Unfortunately, the self-serviced area lacks a traditional beer garden atmosphere. It functions more as a resting point for bikers and hikers. There is no food stall in the self-serviced area. Guests can buy drinks and food in the serviced area and bring it to their tables. Specialties of the house are Schweinebraten (roast pork) with potato dumpling, fresh char and homemade meatballs. The beer served is Fischer's and a Maß Hell (lager) costs €7.60 (July 2017). The Maß Erdinger Weißbier (wheat beer) costs €7.80 (July 2016). Guests of both sections have views onto the Isar and the by-passing timber rafts. Timber rafting in the Mühltal started in the 12th century to transport wood and other goods along the Isar. Today, raft trips on original wooden rafts are a popular adventure during the rafting season from May to September. The raft route leads from Wolfratshausen to Munich (Thalkirchen). Depending on the water level, the raft-trip takes about six to eight hours at a speed of about 30 kilometres p/hour. A highlight of the tour is Europe's longest raft-slide just outside the Gasthaus zur Mühle. Quite often, participants of such raft trips stop at the beer garden for a chilled beer and something to eat. Gasthaus zur Mühle is open from Tuesday to Sunday between 10am and 11pm. Depending on the number of guests, the closing time can be later. Restaurant and beer garden are closed on Monday.